Many hospital labs are subject to hospital-wide benchmarking targets. The challenge is that such targets do not consider the nature of laboratory testing or account for test mix variation, which is important to consider when comparing one laboratory’s performance with that of other peer institutions. The variability of test mix among laboratories can be significant and accounts for the majority of cost and productivity differences among those laboratories. 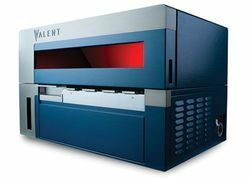 But there may be a better way to set performance targets for hospital laboratories. Laboratory testing represents one of the most complex health care service delivery areas in which to measure staff productivity. One source of complexity is the fact that the testing modality is unique to each laboratory. Laboratory testing also varies significantly from other health care services within the hospital, as it is one of the only service lines that has the capacity to scale up. Automation in the core laboratory or the batching of several specimens generates tremendous economies of scale when volume increases. Conversely, laboratory testing results in a heavy cost burden when testing equipment and personnel are utilized at less than full capacity. 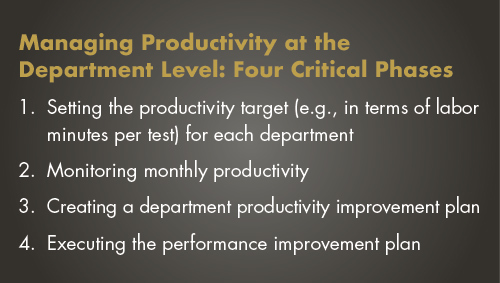 The evaluation of staff performance begins with the establishment of accurate productivity targets, which should be applied at the department level. 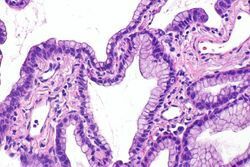 Finance departments will often commingle laboratory testing into two departments within the financial reporting framework: clinical pathology testing and anatomic pathology testing. However, this type of department structure results in the inability of the laboratory (and the finance department) to set productivity targets and monitor performance at the department level, as the test mix varies significantly within those departments. An in-depth understanding of test mix is critical to the establishment of productivity targets and the ongoing monitoring of performance. The American Medical Association recognizes 22 testing modalities (departments) in the laboratory testing environment. Establishing productivity targets at the department level requires the laboratory to design the general ledger structure in departments that are similar in nature. Many high-performing hospital-based laboratories categorize laboratory testing into five distinct departments: core lab, microbiology, molecular diagnostics, blood bank, and anatomic pathology (see Table 1). Within each of these departments, labor standards and test mix indices are similar, but those measures vary greatly among departments. Table 1. 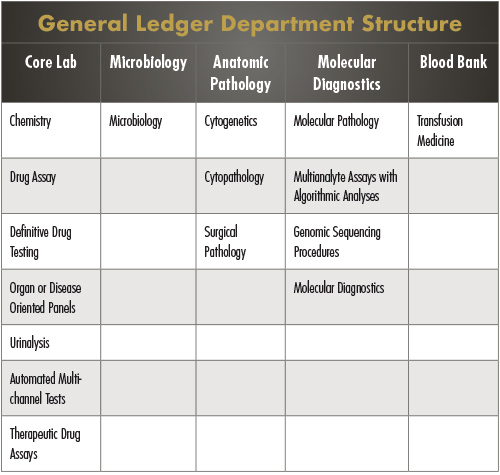 Example of a general ledger department structure for hospital labs. Once the department structure is developed and consistent with the general ledger, productivity targets can be developed and used in each laboratory to monitor performance. One useful indicator of laboratory performance is productivity measured as labor minutes per test (in this case, labor refers to personnel that perform specimen processing and direct testing and excludes management and administrative personnel) by department. As discussed earlier, measuring productivity on an overall lab basis, which is the method used by hospital-wide benchmarking, does not provide the necessary information for the lab to take action. 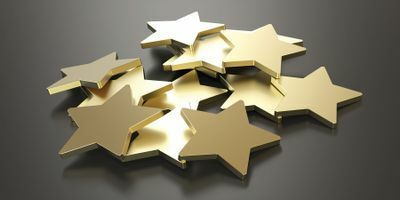 By contrast, setting productivity targets at the department level that aim to reduce the labor minutes per test, even by just a fraction of a minute, can lead to substantial cost savings from one year to the next. Measuring productivity of staff and the laboratory department represents a continuous improvement initiative that includes the establishment of accurate productivity targets at the department level, monitoring of performance on a monthly basis, and the use of best practices to maximize efficiency and personnel productivity. Jeff Myers, CPA, is the vice president of consulting for Accumen and provides expertise on lab operations, consolidation, strategy, outreach, and performance improvement. Jeff has over 20 years’ experience in health care finance, focusing on financial analysis, decision support, strategic guidance, and operational improvement analysis. His industry experience includes physician practice management, health insurance, commercial laboratory, and academic health care systems.